Teenagers are stalked and murdered by a maniac at a town fair. Corky Pigeon ... John Jr.
Woman: [Man gets stabbed and makes painful, groaning sound] What? Did you say something honey? This film is awful yet I actually watched the entire thing. It's weird. 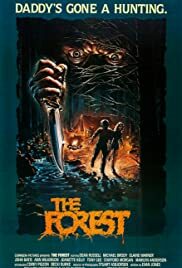 I thought it was going to be a stereotypical slasher film - and it is in one way, the people isolated in the woods with a killer - but in another way, it's different than most slashers because of the ghost kids and wife. Ghost kids that are waiting on their killing dad to be dead so they can go somewhere in the ghost world (they haven't a clue as to where that is)... and the dead mom wanting to hurt her kids -- just weird. OH and the ghost kids help the one girl to live and her husband. The rest of the film is the crazy cannibal slasher dad trying to kill the couples. That's about it... not much else to the film. There is something about this film that kept me watching until the ending... I guess just the weirdness of it all.